PSR-7 is a standard providing interfaces for HTTP messages. The standard interfaces leave little room for implementation details by forcing immutability and streams. It mainly leaves freedom in the way implementations are constructed though. Note: Beyond that, Diactoros and Guzzle still differ slightly. It's a pity we didn't end up directly with standard value objects, but we'll have to do with those interfaces for now. So now, what's the next step for PSR-7? Here's an example to always rollback database transactions with Pomm Foundation. The Stack initiative provides visibility on those HttpKernelInterface middlewares. Note: Stack is inspired by Ruby's rack. So the next step would be to provide a standard interface to allow PSR-7 middlewares. Of course such a standard isn't straigthforward as there are many ways to create middlewares. Names can be debated, but the point here is that calling the next middleware is up to the implementation (can use dependency injection). Httplug is a good example using this implementation. This one requires the response to be passed as an argument, as well as the next middleware. 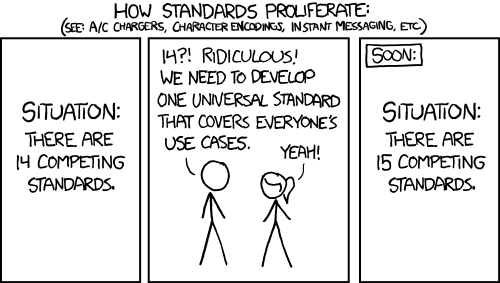 Middlewares are really powerful and PSR-7 would benefit greatly from it, but we're missing a standard for it. As long as it will be missing, we're going to assist to the creation of a wide range of "PSR-7 middlewares", all incompatible with each others. Since this seems inevitable, maybe we should instead try to figure out a new standard that would allow to compose all those middlewares?